But just how “dark horse” is that prediction? Manchin’s discomfort may be related to two recent polls from the Mountain State, both showing solid support for President Trump’s Supreme Court pick. 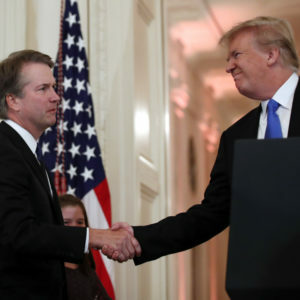 In a MetroWest Dominion Post poll released September 10th, likely voters in West Virginia supported Kavanaugh’s confirmation 62-38 percent. A more recent poll by the GOP polling firm North Star put the number at 51-30 percent. Either way, Kavanaugh has a 20-point margin—not surprising in a state Donald Trump carried by 42 points. What might be more surprising, however, is this number: Kavanaugh’s support in West Virginia is 45-35 percent…among women. The same is true in Heidi Heitkamp’s North Dakota, where Trump won by 36 points, voters support Kavanaugh 53-28 and he has a 17-point margin among women (47-30). Who are these women who are supporting Kavanaugh at the height of the #MeToo movement? They’re women like Suzanne Venker, social-conservative activist and author of the book War On Men. While it hasn’t gotten much attention in the mainstream media, there has been an ongoing backlash on the Right, often led by women, against what they perceive as unfair treatment of men. In particular, this movement has focused on the treatment of male students on college campuses and what they believe is a kangaroo-court approach to justice. “Sadly, it is the case that not all women accusers are telling the truth,” Nance said. The available polling data overwhelmingly show that, nationwide, women voters tend to oppose Kavanaugh’s confirmation. And it’s likely that their already-low support for Republicans in general—and Donald Trump in particular—is taking a hit as the controversy continues. But for Manchin, Heitkamp, Sen. Joe Donnelly (D-IN) and other red-state senators, the national numbers don’t matter. They have to win elections back home, and it appears that the conservative base is getting powered up by the Kavanaugh proceedings—which is bad news for Democrats in Trump country. In fact, the more partisan the Kavanaugh fight becomes, the more likely Republican-leaning women are going to rally around their party. Kavanaugh opponents argue that the best way to offset that is to get the anti-GOP base energized, too, women in particular. But in states where Kavanaugh is +10 among women, that’s a problematic strategy at best.